Ever since the New 52 began in 2011, Geoff Johns has been teasing the arrival of a major addition to the world of DC’s New Gods: The daughter of Darkseid himself. And after four years of hints, she’s finally showing up. Warning: There’s some major spoilers ahead for this week’s Justice League #40. If you’re not caught up, read ahead if you dare! Darkseid and his agents have spent the past four years pottering around the DC multiverse in search of his long lost daughter, but now it looks like he won’t have to wait much longer to see her. 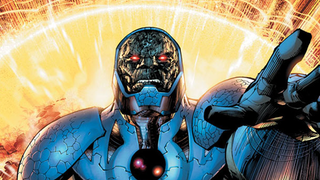 Justice League #40 culminates in with the revelation that the Anti-Monitor has plans to break free from his confines outside the realities of the Multiverse (which is not in a good way, thanks to the ongoing Convergence) by destroying Darkseid and taking his place... and will do so with Darkseid’s daughter by his side. So why has Darkseid been searching all this time for his daughter, if it turns out that she actually wants to see him dead? It looks like we’ll be finding out in this weekend’s Free Comic Book Day special comic, Divergence. Scans of the comic are floating around the internet, seemingly revealing that Darkseid’s daughter is named Grail. Divergence is already setting up what’s in store for the DC universe after Convergence is over (truly, someone at DC is currently a big fan of words ending in “-gence”), including the identity of the new Batman. This seems like an awful lot of crazy stuff to be revealing in a free comic book — but hey, it looks like the DC universe is going to be getting a lot busier, and a lot madder, in the next few months. They might as well try and tell as many people as possible while they can.